Prerequisite is a pkcs12 file containing a single keypair. Usage for this keypair is signing SAML assertions. Start by clicking the plus sign. A new view will show input for friendly name and description. Enter appropriate values then click next. The new view promps for admin to upload the actual file. This either done by dragging a pksc12 file into square on the screen OR clicking on it. A password is required in order to unlock the keystore. Password may not be blank either on screen or for the keystore it self. Note that the password for the private key must be the same as the keystore. Once keystore and password is provided admin can verify the keystore by clicking "Verify and show". It's a good idea doing this since it validates all data prior to saving them to the system. Clicking next will bring a brief summary on what is about to be saved. Finalize with "Create". 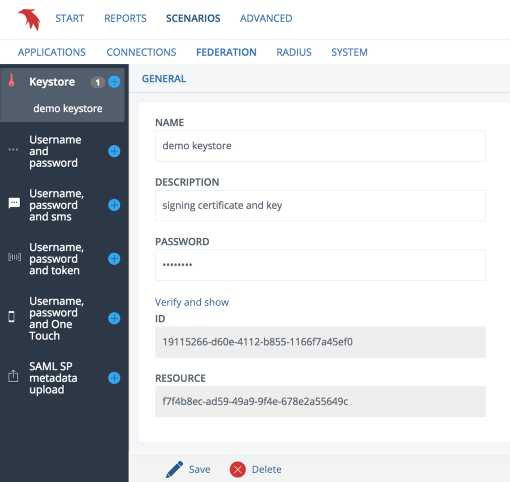 After a couple of seconds screen will reload and the keystore is ready for usage. 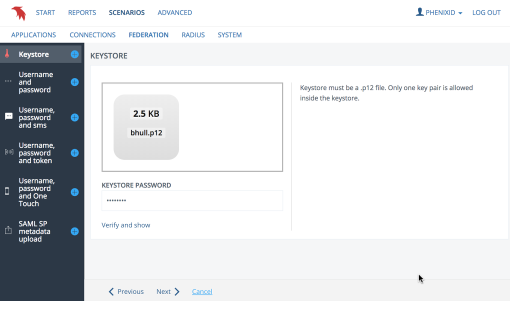 To edit or delete an existing keystore, expand by clicking on "Keystore". 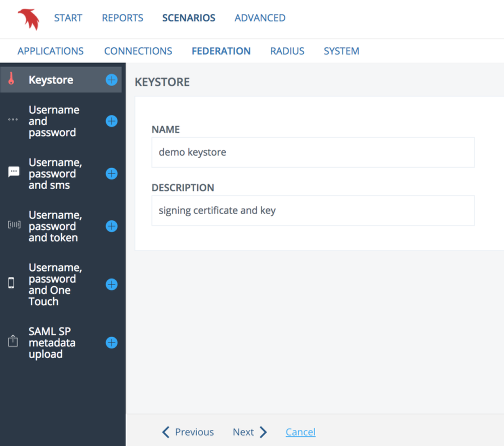 Then select the desired keystore by clicking on the item with the name provided earlier when creating the keystore.